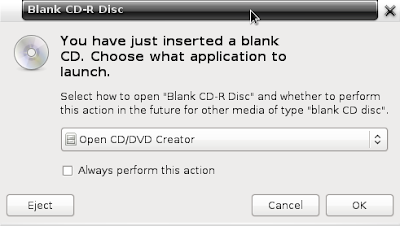 The past few years, as Linux distributions get larger, I've been burning more DVDs than CDs. So my CD burning chops have lapsed. I recently wanted to fire up a Live version of Fedora 14 for some PulseAudio experiments, so I downloaded the ISO which came CD-sized. 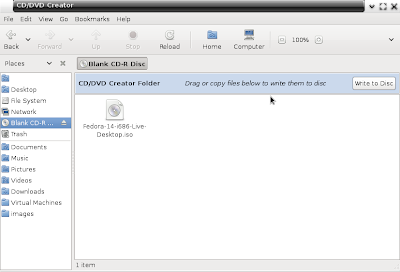 I used Brasero on my Fedora 17 and that burned a copy of Clonezilla quite nicely. Hooray! Of course, my clone didn't work, but that's another story. First, for convenience sake, I burned the first F12 Live CD using my Macbook's Disk Utility. But when I plopped the CD into my desktop, the boot never finished and the DVD player kept humming for about 45 minutes. Something definitely wrong there. Testing on a second PC yielded the same result. Researching Google, I found that other people had similar problems if the application they burned the CD with burned the CD at too fast a rate. This causes the laser in the DVDs to have difficulty reading the source data. Guess I'll have to reburn that bad boy. 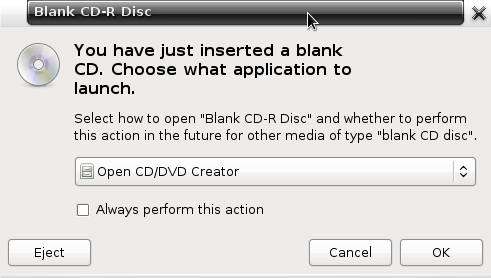 I tossed that CD out and thought I'd give Linux tools a try. I didn't know this next stage was going to turn into a two-hour extravaganza. Burning an ISO in Linux is Easy, No? Surfing around does not yield much usable information; however, one post hinted at a drive or BIOS issue. I rebooted and checked the BIOS..nothing far from standard there. So I figured I'd run cdrecord again using the -dummy switch that means "do everything the burn will do, except turn off the laser." So I did this, again using another CD. If you're counting, that's three. Warning: Cannot raise RLIMIT_MEMLOCK limits. Support for that may cease in the future versions of wodim. For now, the device will be mapped to a block device file where possible. Beginning DMA speed test. Set CDR_NODMATEST environment variable if device communication breaks or freezes immediately after that. Starting to write CD/DVD at speed 48.0 in dummy TAO mode for single session. Last chance to quit, starting dummy write in 0 seconds. Operation starts. Track 01: 686 of 686 MB written (fifo 100%) [buf 91%] 49.9x. Track 01: Total bytes read/written: 719323136/719323136 (351232 sectors). WARNING: Some drives don't like fixation in dummy mode. wodim: fifo had 11331 puts and 11331 gets. Starting to write CD/DVD at speed 48.0 in real TAO mode for single session. Track 01: 686 of 686 MB written (fifo 100%) [buf 91%] 49.7x. wodim: fifo was 0 times empty and 6552 times full, min fill was 84%. Ho HO! It worked!! Fabulous. But why? My bet is on #2. But if you think differently, let me know. I'm just glad to having a working process for burning ISOs to a CD!